If The Mess In Greece Is All Greek To You, Then Read This : The Two-Way This week, Greek will miss a $1.73 billion payment to the International Monetary Fund. The debt crisis has the potential to create financial, economic and geopolitical trouble for Americans. The EU and national flags fly in the foreground of the Parthenon, as Greek voters prepare to decide whether to continue negotiating for more international loans. "It was Greek to me." Shakespeare used that phrase in one of his tragedies to suggest that a complicated matter was beyond understanding. 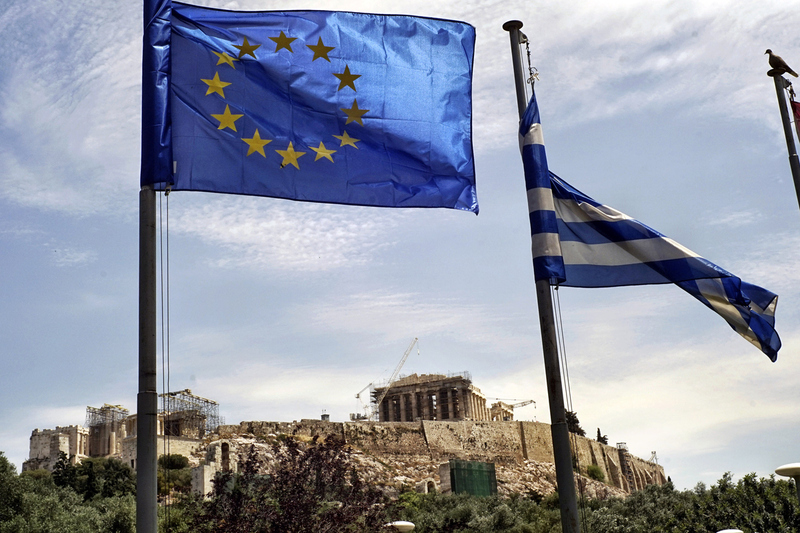 Many Americans may be muttering those words again as this week's Greek tragedy plays out. The situation in Athens really is complicated, but it's also important. So let's walk through the basics together, and then consider what it might mean to Americans. -- The Greek government has way too much debt and can't pay its creditors. -- Because Greece is a member of the European Union, leaders from the EU, the European Central Bank and the International Monetary Fund (IMF) have been trying to work out a payment plan to keep Greece from becoming a deadbeat. -- They have been pushing Greek leaders to raise taxes and lower expenses, hoping such changes would help the government in Athens to make more debt payments. But the parties have not been able to reach an agreement because the terms would inflict more suffering on Greeks, who already have seen many government cutbacks. -- So the Greek government, faced with a payment of $1.73 billion on Tuesday, said Monday it will miss that deadline. And it has set a referendum for Sunday to allow Greeks to decide for themselves what to do next. -- At the polls, Greeks will tell their government whether to keep working out a repayment plan despite any pain or continue down the default path, missing more and more payments in coming weeks. Missed payments would open the door for the ECB to let the Greek banks collapse and for the country to fall out of the eurozone amid economic chaos. Most economists say a "no" vote would have such terrible consequences — including the possibility of a devalued new Greek currency and dramatic erosion of the value of Greek assets — that they can't believe voters would let it happen. Regardless of Sunday's outcome, Greeks already have suffered terribly. Their banking system is fraying, the tourism industry is eroding and poverty is rising. But do Americans really have anything at stake here? Directly, not so much. But indirectly, maybe a great deal. Those who see no big deal rightly note that Greece's economy is tiny, about the size of Connecticut's. Think about it: Other than Kalamata olives, can you recall any product you have bought from Greece? The dollar value of U.S.-Greek trade amounts to a rounding error. Moreover, the Greek economy has been a mess for five years, giving U.S. investors plenty of time to limit any direct exposure there. A too-strong dollar — If Greece stops using the euro, then maybe other economically weak European countries, like Spain or Italy, also could throw in the towel. That would make the euro's future look less certain, driving down its value and boosting the dollar. When the dollar gets too strong, our exports get more expensive in the global marketplace. Geopolitical setback — If Greece becomes a weaker state, it could allow Russia to get a firmer hold in the Balkans. Also, Greece is a front-line player in Europe's migrant crisis, so if it reduced its cooperation with the EU, that could make migration matters worse. IMF loses credibility — The IMF has been providing lots of financial support for Greece and now stands to lose something like $24 billion in a Greek default. Given that the U.S. is a big supporter of the IMF, that could have an impact on taxpayers. Increasing investor doubts — If global investors start to lose faith in weaker countries' ability to repay debts, there could be a general flight to safety. In other words, everyone will want to send their cash to the United States and Switzerland, and that would hurt investments in emerging markets in Asia, Latin America and elsewhere, increasing global wealth imbalances. Tourism disruptions — Travel agents and airlines should be seeing a booming business this summer in Greece. With cheaper jet fuel and a strong dollar, it's a great time to see the Parthenon. But photos of tourists lined up at empty ATMs doesn't exactly put Greece on the top of vacation wish lists.